These places have gone out of business. Many are fondly remembered, others not so much. We've listed them here because there's often a lot of conflicting and out of date information online on other sites so here you can verify if a place is really gone. Sometimes places close and then re-open so if you see someplace below that IS OPEN please write us at info@puertoviejosatellite.com with any details/photos you have please! One of 2 places in town to buy gas. Sports bar and restaurant just across from the barge on Playa Negra before the bridge to town. Jungle Book Store. Open Tuesday - Friday from 11:00am to 6:00pm. 60 meters before Cabinas El Tesoro. Bookshop with a big selection of childrens, fiction, self help and body and spirituality in both English and Spanish. Open daily except Sundays 8:00 am to 6:30 pm. Family-oriented dental practice who can take care of your everyday dental needs, including fillings and teeth cleanings, oral rehabilitation and dental implants. Family-oriented practice looking to maximize patient convenience, comfort and satisfaction. Equipped to deliver every service from restorative to reconstructive, periodontal and cosmetic dentistry. Hardware and building materials. There is also a somewhat larger hardware store on the road leading into town. Pizza restaurant, hostel and cabinas. Hostel above the restaurant with big oceanfront terrace. 3 rooms which sleep 14 people; 6 bunk beds and 1 double bed. There is free WIFI, a bathroom, coffeemaker, tv and guests can use a downstairs cooking area. Also there are Four separate Cabinas for 1-3 persons each with a private bathroom, fan, mosquito netting, fresh linen and towels, a small sitting area in front from which you can see the ocean and WIFI. Throughout the 65000m2 property, small gardens and forested sections highlight the omnipresent vegetation with a mixture of well known ornamentals and the fabulous tropical fruits. Rooms are large and comfortable. They all have two Queen Size beds, and a private bathroom. Rooms are available in three price categories. Affordable and eco-conscious accommodations for all types of travelers. Our cabinas are surrounded by exotic fruit, vegetable, and flower organic gardens. Each cabina has fully screened windows, private bathroom with hot shower, fan, bedding and towels and includes delicious homemade breakfast! C & J Juice Joint and Homemade Bakery are on-site to provide you with fresh, natural juices and tasty treats. Located 2.5 km south of town in the protected area of Cocles. All beach front rooms, peaceful in harmony with nature. Designed in a very rustic-exotic way according to the architecture of the region; cabins have no TV set, no telephone although there is a TV room near the restaurant. The lodge has lots of wood, wide corridors, rooms are very well aired and of course, you can enjoy the Caribbean culture and the exuberant flora and fauna of the place. 13 rooms with restaurant and bar, including 1 handicapped accessible room. 5 newly remodeled one bedroom units with kitchenette and cable TV. Budget accommodations available both short and long-term. Global Creek @ Jo Jo's Jungle Retreat is a union of a number of different concepts seamlessly merged into one: a lavish jungle retreat and vacation space; an environmental education center; a yoga and meditation spa; a community education center, and a working model of environmental sustainability and social responsibility. Longer term stay rooms for rent. Situated in beautiful garden and close to beach. Cozy Beachfront Cabinas all with private bath just 1 mile from town. Located in front of the ocean and engulfed in nature, where the combination of ocean breeze and rainforest brings tranquillity. Apartments and rooms with a magnificent view of the ocean and competitive prices. Apartments are fully equipped, bathrooms with hot water and private balconies with ocean views. Prescriptions and the coolest A/C in town. A real estate service encouraging sustainable development in the Southern Caribbean zone of costa Rica. Offers turn-key building solutions for the Caribbean coast of Costa Rica. Home/property packages. Specializing in real estate in and around the Southern Caribbean coast of Costa Rica. Committed to protecting and preserving our natural surroundings. Real estate company with office located in Cahuita and properties throughout the South Caribbean. Bicycle sales, accessories, repairs and rentals. Wider selection of bike rentals than most places in town. Surf classes, board and equipment sales. Cell phone and computer repairs, parts and accessories. Located in the heart of Puerto Viejo, right on the beach! Enjoy our tropical garden under the shade of the mango tree with your feet in the sand and a view of the Caribbean infront and the Costa Rican jungle behind. Serving great breakfasts, lovely fresh salad and soup lunch menu. Beautiful setting for dinner in the candle lit garden on the beach. Tex-Mex Food. Delivery and catering only. Come relax at the joint with fresh juice, homemade treats and good music. Fresh juices made to order, lickety-split. Check out our popular lime pie and legendary apple pie. Or select from our pies, muffins, cookies and specialty cakes. Special orders encouraged and accepted for those birthday and dinner parties! Breakfast, lunch, snacks and coffee. Open 7am to 6pm daily. Specializing in crepes. Happy hour. International beers, TV, table games. Fresh, local produce prepared from scratch in the kitchen. Lots of vegetarian and gluten-free options. Fresh bowls and smoothies and handmade naan bread sandwiches. Open 10 - 6pm Tuesday - Sunday. Located at the Lotus Garden Hotel. An absolute must in dinning choices in Cahuita. Chef hails from Montreal and is restaurant is very highly rated. Kind of New York Style Bistro with Caribbean Flair. Fine dining restaurant with weekly changing menus. Gourmet fusion cuisine from the Caribbean to Asia through the Mediterranean for food lovers. Located in a tropical garden. Owners Chef Andy Cook Campbell and Molly Meehan are dedicated to offering the freshest ingredients with a menu inspired by traditional Caribbean cooking fused with inspirations from around the World. Andy grew up on the Talamanca Coast right here in Manzanillo where he grew, harvested, and caught much of the food he and his family cooked at home. Molly is an herbalist and farmer from the US also dedicated to incorporating natural and healthy foods into our menu, while maintaining our signature Caribbean Latin flavor. Cheap and Cheerful. Great local restaurant run by a local Agentinian couple. Try the fish tacos! Local Bar with Caribbean food cooked by infamous Boi-Boi. This place is for people looking for more of a less tourist bar/restaurant experience. Gourmet food, ambiance & service in a beautiful jungle setting. Vegan restaurant and bar. Hosts live music and other events. Located at Hotel Puerto Viejo. Ocean View restaurant - famous for chicken wings, homemade burgers, Swiss and English style fish & chips, special platters as well as Rondon on Saturday's - check it out. A gourmet’s paradise. Affordable culinary specialties and a fabulous bar Open 6-10p.m. at Hotel Kasha. Authentic Thin crust Italian Pizza. Does delivery for extra charge. French Gourmet Café & Restaurant. For breakfast and lunch, starting from 7:30 am. Crepes, croissants, delicious hot sandwiches made on baguette,etc. homemade desserts. Facing the beach, in Manzanillo (50 meters after the MINAET's office). Locally owned bar and restaurant in center of town. Often feature live music (reggae or calypso typically). Restaurant and bar with an Australian theme. The food served consists of barbecued steaks, ribs, chicken wings, Aussie burgers and fries, sauteed vegetables, roasted potatoes, salads, homemade sauces and soups, fresh sea food, whole fried red snappers, crab cakes and local dishes. A variety of cocktails are also served. Popular Argentian Parilla (Grill) serving steaks and other dishes. Gourmet Roasted chicken to go. Located in same building as Mega Super. Owned & operated by Italian Chef. Serves italian and international Cuisine. Located on main road just 300 meters south of main entrance to town of Cahuita. Authentic Caribbean food cooked fresh. Where only the freshest and locally sourced ingredients are used to create your Zion experience which can be enjoyed on our street side terrace, in our courtyard garden or on our rooftop. Try our smoothies, wraps, vegetarian fare and more. We serve breakfast & lunch and we are situated 50m from the police station in Puerto Viejo in front of the beach. We look forward to meeting you. Test Spanish on the Costa Rican Caribbean since 2005. A Waldorf Kindergarten serving children 2-6 years. Parent Child Groups. Spanish and English spoken. Legal services for buying and selling real estate, contracts, permits, corporations. Over ten years experience in the area. We speak English, Spanish and Italian. Internet cafe. New location open Dec 2008 with 50 computers, A/C, 8 megabit super high speed connection and wireless network accessible from all over town. DVD rentals too. Italian styled butcher and deli. Open Mon to Sat 10:30 to 6:30. PADI, DSAT and DAN Dive Center. 5 star PADI dive center offering diving for certified divers, discovery dives for those wanting to try diving for the first time and certification courses. Dive shop! Full PADI open water courses. Dolphin trips. Fun Dives. Snorkelling. Sunset Cruises. Fishing Trips. Diving Punta Uva. Has the largest fleet of Bikes & Scooters in Puerto Viejo, all protected by a roadside assistance program. 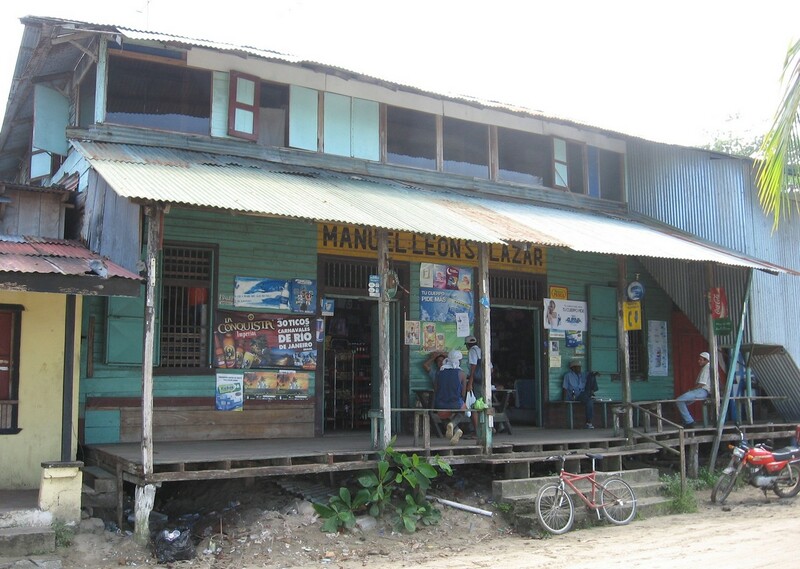 In addition they book the Bocas shuttle and off the beaten path custom tours. Daily shuttles from/to San Jose to Puerto Viejo in modern vans, professional drivers, A/C, fully insured, door to door services. Accommodations, tour reservations, real estate information. Also home to the popular Tropical Tales publication. New and comfortable Caribbean style jungle house built with concrete combined with bamboo in a tropical garden where you can spot all the local wildlife including toucans, monkeys, sloths, butterflies, birds and much more The house has two bedrooms and is suitable for 2 to 4 people. There is really spacious comfortable living area to relax, a equipped kitchen, a tiled bathroom with hot water. Laundry service (wash+dry). 10 minute walk to one of the beautiful beaches of all Costa Rica, Playa Chiquita. Nearby there are lots of activities you can choose to do, or you can just sit back and relax and enjoy the peace and quiet. Rates 125 - 150 US$ / night. Short or long term rentals, 500 meters from the beach inside botanical garden. Affordable accomodation for singles, couples and groups. There are 5 houses, each with 1 to 3 bedrooms, set up resort style with pool, BBQ and observation deck. The property is located 1 km before Puerto Viejo. Sleeps from 1 to 18 persons. Rates from $29 per night. Set 50 metres from the Sea, this is a rustic cabin with coffee-maker, refrigerator and lovely tiled shower. Front porch includes lounging and eating areas with an amazing view straight to the Caribbean Sea. Private driveway and outdoor area, include chaise lounges. Beautiful house with tropical garden. (506) 750-0212 or info@casabarb.com. Sleeps: 10. Bedrooms: 3. Bath: 1. Minimum stay: 2 nights. Spacious wood house, perfect for one big family or group of friends who likes to spent a relax, private time surronded with trees and just steps away from the fantastic beach of Punta Uva. Equipped kitchen and large terrace. Beautiful Caribbean style house situated just a short walk from the shops, restaurants, and nightlife of Puerto Viejo, and just 200 meters from Playa Negra (Black Beach). Close to the beach, jungle, and town! Casa de Delfines is fully equipped with 3 bedrooms and 1 1/2 bathrooms. The 2nd floor open air living room is the perfect place to relax in a hammock and listen to the sounds of the waves crashing and the jungle. The downstairs bedroom is air conditioned and is the ideal room to keep sensitive electronics. Securely fenced and gated. Centrally located accommodations in a quiet corner of Puerto Viejo within walking distance to restaurants, shops and the beach. Two bedroom caribbean style house with front porch and outdoor garden dining area. The property also has a separate building with additional four bedrooms of which two have their own shower and bath and two have shared. Free WIFI and private parking. Affordable guesthouse in Playa Chiquita. Ten-minute walk down a winding tropical path to a white sand beach. Your casita is reached along a short pathway from the main house. The casita is simple yet cozy and clean, with a tiled outdoor sitting area, two single beds with mosquito nets, a fan and a small bathroom with a hot water shower. Porch looks out onto a lush tropical garden with visiting toucans, Howler monkeys and more. You are welcome to use the main house kitchen and outdoor living area and stay includes use of a bicycle with child seat. Your hosts, Silk and Soleil Chauncey, are originally from Victoria, Canada. New house, 75 sq. meters, fully equipped in a bright tropical garden, just 200 m from the beach of Playa Chiquita (direct entry). Near to all services, such as supermarket, restaurants, bike rental, so on. Big porch, table with 4 chairs, 2 bedrooms with double beds and a sofa-double bed, complete wood furniture, complete kitchen with gas-oven and big fridge, washing machine, internet wifi. Private parking. Airy and relaxing. Owner present on site. English, Spanish, German, French and Italian spoken. Very large one bedroom house, fully screened with glass windows and doors. There are two modern-style bathrooms; one with a Jacuzzi tub. The bedroom has a comfortable king size bed, small closet safe, air conditioning, a walk-out second floor deck, a telephone with free local calls (long distance with phone card) and free WIFI internet access. The kitchen is fully equipped with a fridge, stove, oven, blender, and coffee pot. 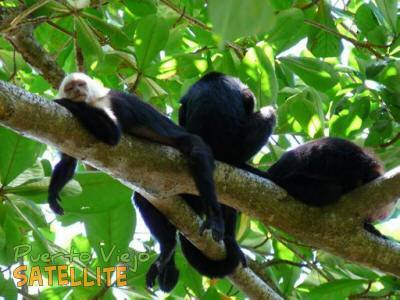 Set in a lush tropical garden setting, there are many birds, sloths and monkeys on and near the property. A small two-story house recently built, is located on a 2,5 acres property of protected forest, in the heart of the wildlife refuge of Gandoca-Manzanillo, and 5 minutes from the beach of Playa Grande. Apartment-hotel offering 3 fully equipped 1 bedroom apartments sleeping 1 to 3 persons. Pool/jacuzzi, cable TV, laundry and internet services available. Elegant seaside cottages. Elevated and designed to catch both sea and mountain breezes, these hand-crafted cottages made of tropical hardwoods provide not only a cozy and comfortable “home” but the setting for an unforgettable holiday. Located just 100 meters from the famous Salsa Brava beach in Puerto Viejo. It is quiet, accessible to both the black and white sandy beaches, close to the great restaurants, bars, supermarkets, buses, taxis, surfing, scooter and bike rentals, horseback riding. Several houses for rent in the heart of Manzanillo. Previously known as Faya Lobi now under renovation by new owners. Beautiful boutique villa made by an architect of tropical hardwood. 200m2 big with three bedrooms large living area and veranda. An indoor courtyard, huge bathroom, an 2500m2 garden and a lot of beautiful details makes this an unique tropical hideaway. The luxury villa is only a few minutes walk from the most beautiful beaches in Costa Rica. Luxurious and stylish vacation home. Three bedrooms each with ensuite bathroom, private pool, well equipped kitchen with dishwasher. Washer and dryer. A/C.